Today's post primarily focuses on news of the Duke and Duchess of Cambridge's homes - past (Anglesey), present (Kensington Palace) and future (Anmer Hall). In lieu of sightings or engagement announcements there has been a series of articles published in recent days on the couple's residences. Most noteworthy has been information concerning Anglesey. It has been revealed the house William and Kate rented in Anglesey - Bordorgan Home Farm which is on an estate owned by Lord and Lady Meyick - has its own racetrack. Prince William is said to have enjoyed riding his Ducati motorbike around the Island. The farmhouse was originally intended for their son before William and Kate moved in. 'The property is actually two houses stuck together, there are two staircases - one in the center of the first house and upstairs there are two bedrooms in the first house and two in the second house, so it's a four-bedroom now they've been pulled together. It has access to a private beach which nobody else could reach, onto the estuary... You could see the water from the bedrooms on the first floor, which look over the top of the outbuildings. The outbuildings surround a farmyard and you have to go through the farm yard to get down to the beach. A first glimpse of the £750-a-month farmhouse has been released, sharing a look into the couple's pastel-coloured dining room complete with French doors, ornate lighting and picturesque views of the beach and Newborough Forest. A fabulous place to entertain guests, I imagine. 'Giggling as they adjusted their Day-Glo comedy afro wigs, the young couple slipped into their seats at the Empire picture house in Holyhead without a hint of fanfare. It was just weeks before Prince William and Kate Middleton announced their engagement - becoming perhaps the most talked about couple on the planet. But in those last carefree days of the summer of 2010, the future King and Queen were simply two revellers among a group of friends from RAF Valley dressed in seventies-style-get-ups on a "team jolly" to watch Toy Story 3. Jean Owen, the manager simply couldn't believe her eyes. "They turned up in fancy dress and wore big afro wigs. Prince William's was purple if I remember rightly," she said. "No one knew they were coming until they tuned up, and they said they were wearing the wigs for charity." The piece goes on to paint a picture of a young couple enjoying a normal life on the isle, with privacy most public figures could only dream of. William would regularly go jogging through the village and chat with locals along the way; the couple were often spotted pheasant shooting, surfing at nearby Rhosneigr and taking romantic strolls down the beach. While we're used to seeing Kate donning designer pieces from Jenny Packham and Alexander McQueen, locals in Anglesey were accustomed to seeing the Duchess very casually dressed with her hair tied back and wearing little or no make up. One of Kate's favourite shopping destinations during her three years on the island was the Homebase D.I.Y. store on the Penrhos Industrial Estate in Holyhead. According to staff, Kate would spend up to an hour at a time browsing through the store, particularly in the lighting and bathroom department. Among Kate's purchases at the store were a £9.99 love cushion which promises to instantly update any room; a 'faux leatherette magazine file; and a £12.99 memo board, commonly used for treasured pictures. In stark contrast to their life in Anglesey, Kate will now be firmly focusing on placing the final touches to Apartment 1A, the couple's new home at Kensington Palace. It is thought William, Kate and George will move in over the next couple of weeks and of course everyone is eager to know how the newly refurbished apartment will look. 'It is actually a spacious four-storey, twenty-room property with its own large South-facing walled garden, which takes up half the Clock Tower wing originally designed by Sir Christopher Wren for King William and Queen Mary. Apartment 1A is marked below as 'Margaret's Apartment'. The Queen's sister Princess Margaret resided there until her death in 2002. 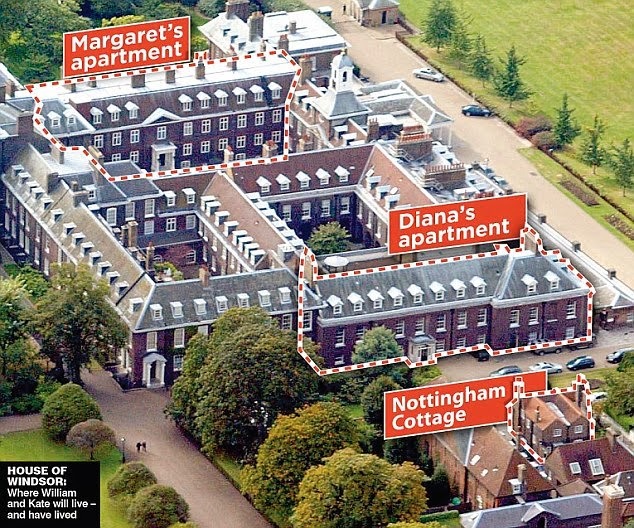 We also see the late Princess Diana's apartment and Nottingham Cottage, the Cambridges temporary two-bedroom home in the grounds of the Palace. It is understood the Duchess has been given her pick of stunning antiques from The Royal Collection (one of the largest art collections in the world, held in trust by the Queen). Members of the Royal Family are permitted to borrow pieces to furnish their homes and my goodness, what a magnificent collection it is. I simply do not know how one would choose, and I have no doubt it has been a highly enjoyable process for Kate, a history of art graduate. 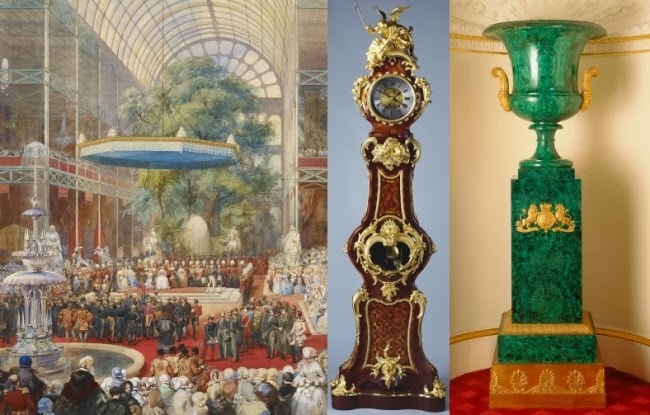 Below we look at three pieces from The Royal Collection: The Opening of the Great Exhibition 1851, the Longcase Equation Clock and the Malachite Vase. It is believed a state of the art kitchen has been fitted and the Duchess has been spotted shopping for fabrics in department stores such as John Lewis and the Chelsea Design Centre. According to widespread reports, it has been decorated in shades of warm cream. I have no doubt Apartment 1A looks incredible. As Kate finishes decorating Apartment 1A, she will soon be turning her attention to Anmer Hall. The Queen has ordered renovation work to begin in the surest sign yet the Georgian Mansion is set to become the Cambridge family's country retreat. 'Diggers are removing topsoil from a field in front of the 10-bedroom home to create a new drive that will provide greater privacy. The recruitment of dozens of armed officers is underway to help provide security. It's been quite a year for William and Kate who are no doubt looking forward to settling into their new home with Prince George at KP, while Anmer Hall will provide a secure location for them to relax and enjoy country living away from the public eye, similarly to Anglesey. What are your thoughts on the Cambridges' homes and Kate's reported home décor choices? Fabulous post, Charlotte! I love getting a tiny glimpse into William & Catherine's home life. It's obvious that they love Anglesey! But isn't it possible for them to keep their Angelsey house as a country home? Instead of Amner Hall or maybe together with Amner Hall. Because they really seemed to love it there, and although William isn't working there anymore, they could still live there? Not possible really because they were renting it. Besides it's too small and out of the way for their new lifestyle. It will be interesting to see in the future what interest she might take, if any, with the monarchy's vast art collection since she was an art history major. I think the choices she has made so far are beautiful. I also think that the Anglesey residents are truly wonderful for giving this special couple their own personal space. What a nice post today. I love that you took the time to bring us a grat insight into the new homes that our Duchess & William will be living in. Wow I woudl give anything to have a chance to see into the finished homes. I bet they are just beautiful. Thank you for this great blog and all your time you spend for us fans. Can't wait until we get to see this beautiful couple together again. But I hope they are enjoying their time as a family. Thank you once again Charlotte for this surprise post. Kate's choices are fabulous. What a thrill it would be to have a choice from priceless antiques to furnish their new home. Wow and Kate interested in history. These information pieces are great and I and the fellow bloggers are very grateful for your time and patience. Thank you so much once more and have a great day. I don'tunderstand what you are trying to say. What I beleive you are saying is that the Duchess does not work much and to this I say she is not a full time working royal nor will she be for awhile. And this is per the Queen and Prince Charles. If this is what you are not saying then please explain your remarks. Kate is leading the same style of early married life as the Queen did and no doubt with the Queen's blessing. Their move to London heralds the start of a busier public life next year. Good luck to them. Thanks for all the great information, Charlotte. Gillian, I have been reading so much about how Queen Elizabeth so wants them to have those first two years to themselves, just like Philip and her had. So back off respectfully anyone who has problems because, your frustration at them not working enough(in your eyes) is only frustrating you and not the Queen. As for the popularity of Will and Kate still, an all time high. I hope they are soon settled in their own home in Kensington Palace. I suspect it will take some time for Anmer Hall to be ready as some archaeologists are having the first dig to see if there is anything underneath the lawn and where they are making the Church car park. It's great to turn on the computer in the morning and find a new and informative blog, Charlotte--but I do worry about your lack of sleep! Jean it would be such a bummer if archaeologist found something profound. I say that for Will Kate and George's sake. For history's sake fantastic but, I so want them to be able to finally settle in somewhere. All the moving around is not easy with a new born, as you know. Charlotte, I am so looking forward to the day they can all settle in to their home. All this moving around ugh :( As glamorous as decorating sounds, it's a lot of work. You think you like one color paint and then you see it on the wall and oh my gosh it's horrible. I think Anglesey will forever be one of the most special places in their lives. I think that the people who live in Anglesey are also very special. I really hope that Will and Kate fence in the huge backyard garden they could have at Apartment 1A. Princess Margarets walled garden doesn't seem to exist anymore, and, in any case, wouldn't provide enuf space for a swing set or trikes and bikes for George and any siblings. If you hear anything about this, Charlotte, please let us know. It's amazing what these two have gone through in the last 2+ years and people still say that they haven't done much. They got married, went on 2 international tours, represented the country during the Olympics and Jubilee, renovated 2 homes, moved 2 times (once into Nottingham and now into Apt 1A), had a child and changed careers (William). That's a lot of stress crammed into 2 1/2 years. They say that moving, changing jobs and having a child are the most stressful things that a human can go through. I must say with all of the changes that Kate has gone through (along with adjusting to life as a royal -- ie, the wardrobe changes 5 times a day when with the Queen, curtseying and learning other royal etiquette, etc) plus learning/researching and visiting foreign dignitaries and charitable organizations, she rocks! It's amazing that she has gone through all of this and still is looking great and taking care of herself. She certainly is an inspiration. Now, some of you may take exception to my praise but trust me, all of these things are stressful. I moved across state lines, changed jobs and renovated a 2 bedroom condominium one summer and even though all of the changes were postitive ones, they are still stressful and take a toll on the body. Kate's life has completely changed from what it used to be and after 2+ years, she still is doing great. Good for her! You are right, they have packed in a lot in a short period of time. Just thinking about it (especially changing clothes 5 times a day) makes me tired! lol We tend to forget about all they do behind the scenes and out of the cameras glare. Well said Lyn. But there will always be someone that visit's thsi blog that think Will & Kate should be doing more. But the only ones that matter is the Queen & Charles. It they are ok with it then we shoudl be too. Lyn you are so right William and Kate have done so much these past 21/2 years. There is so much more we don't know about such as meeting and research for charity that takes a lot of time. I hardly think Kate sits on the couch and eats bon bons !!! I am tired of people thinking Kate does nothing. She rocks and is an amazing role model all over the world. 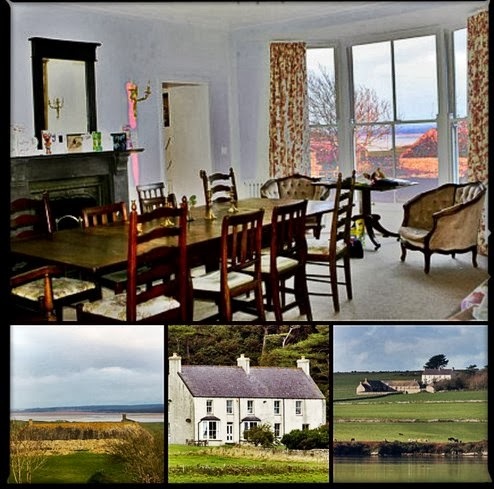 I would love to spend a vacation week at their former Anglesey home. What stunning views it must have and there's nothing more peaceful and relaxing than a beach in my book. Even if they were offered ALL of Kensington Palace, I have a feeling they would prefer the privacy and relative anonymity of Anglesey. The pieces from the Royal Collection are rather grand :) but I doubt that every room will be filled with them. Aside from paintings, I think these pieces would be used in formal rooms, entry halls, etc. I do love the way their Angsley was decorated, it looks so warm and cozy. I have to say the thought of Kate in an afro wig would have been a sight to see. I would have killed to see a picture of that. I'm happy that they had an opportunity to have fun and live like any normal newlywed couple. I'm sure they are going to miss their life there. I'm hoping that we see some upcoming Kate engagements sometime soon. Charlotte, I loved your post! Just delightful. Thank you for this update, Charlotte! A lovely job! I'm not surprised Kate's chosen neutral colors to decor Apartment 1A! It's what we are used to see when it comes to her and I absolutely love it! Very chic, indeed! I hope they get to enjoy a good life in London. And by good I mean no paparazzi craziness. I'm sure they will miss that quiet time in Anglesey! I think that would be a lovely place to raise Prince George! I can't wait for a new engagement! And I guess we will hear about the christening soon! Oh how I wish I could be a fly on the wall inside their new apartment just to see how beautiful it must look! The wallpaper she selected is really lovely and will go with just about any furnishings they select. Maybe someday there might be a picture or two of the family inside their home, kind of like the ones of Diana and Margaret. Thanks for the great post Charlotte! It's so nice to see behind the scenes. Hi Charlotte thank you for another great post. The pictures of pieces from the royal collection are wonderful. I m very into art so this was especially interesting for me to read. I don t really understand why kate is said not to work enough, the past two years have been full of engagements like the olympic games. I think she should be allowed to spend some time as a mother now. Next time when i m in london i hope i got the time to take a look at kensington palace though anglesey looks more cozy ;-) but kensington is more appropriate for the future king and queen. Oh what I would GIVE to see how beautifully these homes are decorated! Happy to see a tiny glimpse into their Anglesey home. I absolutely LOVE the picturesque views. Quaint, beautiful, and so relaxing. You can definitely tell why they loved living there. I am positive 1A and Amner Hall will be breathtaking on the inside. Her neutral colors choices are so classy and to have her pick of the Royal collection, both homes will be gorgeous! I have always wondered how hard it is on William when they are at Nottingham Cottage to have constant views of his childhood home and the last place he saw his mother alive (Apt 8 and 9). Just a thought. I know some others have mentioned, but to think all the changes, moves, etc. William and Kate have gone through over the past couple years, especially Kate. While through marrying into the Royal family and all that comes with that, having multiple homes with moving decorating, and giving birth to the future king of England, I would say she has done an AMAZING job. She has handled herself with poise, dignity, and class. Many would differ with me, but I think she is a breath of fresh air to the Royal family and especially the Queen. Many would have crumbled with everything on Kate's plate and so much being done for billions of eyes around the world to see. I think she is a wonderful role model and inspiration for so many. I am glad they have some down time together to get settled in their home and just be a family. These are such precious times with little George and one that will never be forgotten. I hope they make memories that will last a lifetime! Charlotte, thank you for a lovely post and a little glimpse into Will and Kate's beautiful homes! Such a FUN post! Loved it! Have a wonderful weekend! PS....Will and Kate's joint coat of arms was just released. Was interesting to see! I know what you mean when you say many would differ with you. I stumbled onto a web site not long ago that was mercilessly cruel to the entire royal family and especially to Kate and the Middleton's. I don't understand their animosity-I think they are all wonderful! You have to wonder what goes on behind closed doors don't you? It certainly is a daunting responsibility for such a young lady. She does seem to take to her "job" with gusto and is certainly providing William a wonderful help mate. They seem so down to earth but you have to wonder how long they can keep up with desiring to be an ordinary couple because of the enormous tasks ahead of them. I wish them all the happiness in the world. I'm certainly no expert but I would expect they have already added more staff and she will certainly have plenty of help running and managing the two homes. Not all of their staff additions are announced to the public and, remember, KP already has an enormous staff in itself so some of the duties at 1A will be tended to by those people. It's no secret nor any criticism but girls of Kate's station are groomed for marriage to wealthy aristocrats and part of that training involves being trained to manage servants and run a large household. Lovely couple. Reading your articles makes me realize we are world's apart from their life. I admire them for what they do. I'm a pretty private person and don't think I would like being in the limelight at all so I really give them credit. Hi everyone im from London and a big supporter of the royal couple. Ive read this blog for a long time and I really like it. Great work. William and Kate are very much in love. I reckon they will have more children 3 in all 2 years apart. Whats happened to Catherine is absolutey monumental. The weight of history and heritage is phenomenonal. There's no need for her to rush anything. We ship give her tome and space. The Queen loves her grandchildren and is pleased they're happy. She has blessed the relationship from the beginning and provided them everything to make their life happy its plain to see. . Thank you Charlotte. I must also add I am one of the few blokes on this blog. I live down the road from Kensington palace and an avid reader of royal history. I find your blog tremendously fascinating. I can't wait to read the next installmens. Keep up the good work. Respect from Notting Hill. You know the ladies are always saying it is a pity more men don't comment. We would love to hear a male perspective on all things royal. I know a few of our Anonymous posters are male and I regularly receive emails from male readers, it would be simply wonderful to see them contribute more. Kensington Palace and the adjoining bit of Hyde Park is so peaceful and beautiful especially in the summer time. I regularly take time out and picnic and watch people and families strolling around or relaxing. U meet so many tourist it's nice to hear different languages. The area is so vast so romantic. The Diana memorial fountain is beautiful a must see. Can't wait to see baby George grow take his first steps with Will and Kate guiding him on both sides kinda thing. First day at nursery school with little rucksack etc. :):) maybe play football and one day play for the mighty Tottenham Hotspur. Haha COYS. 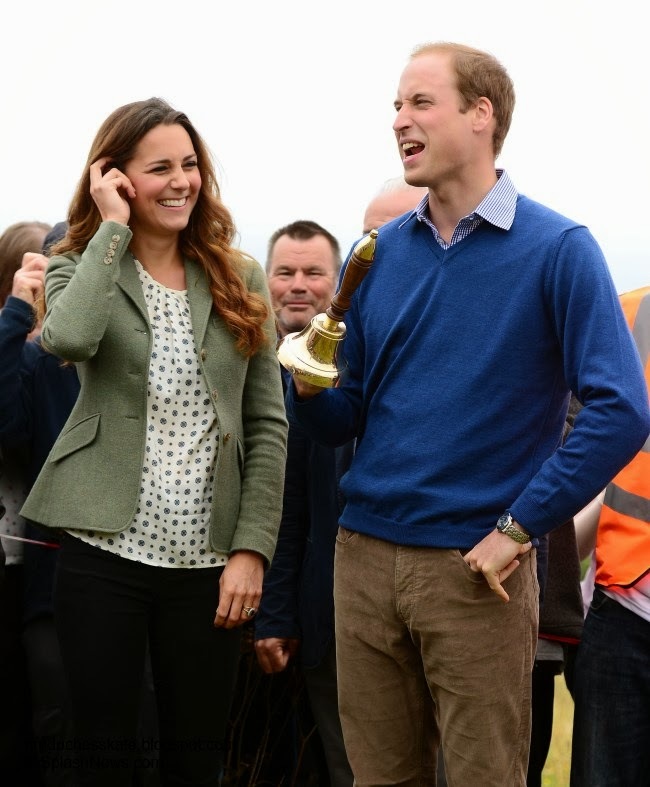 Wills is patron of the football association and Kate is a sporty girl too. Thank you lady Charlotte for ur blog post. I'm hooked. Interesting post. I wonder - is anyone living in Diana's old apartment or has it been kept as-is for William and Harry? While the offer of the royal antiques is awesome, I just can't picture William or Kate wanting anything so fancy for their private living quarters, though their formal rooms, where they will receive official guests and entertain, might be another story. Also, thanks for the great overhead shot of KP. It's the best one I've seen yet that shows the park that Will and Kate have. It's always been a bit confusing about where the park actually was. I was surprised at how few quality photos there are of KP out there. It would be great to see a detailed section on The British Monarchy website with photos/info on royal residences. I read that Diana's old quarters were used as office space now. Perhaps one day her grandchildren will renovate and use that apartment as living space. Greybird K, I love that idea! Quite an interesting post! I've always been curious to see what the cottage in Anglesey looked like and now I see why William and Kate loved it. It looks so sweet and comfortable and of course private. I think Kate thoroughly enjoyed taking a pick of the Royal Collection , it must have meant quite alot to her as a history/art student. The collection is truly delightful - I wonder which pieces caught her fancy? I know KP apartment must look wonderful knowing how carefully the Duchess picks her styles. 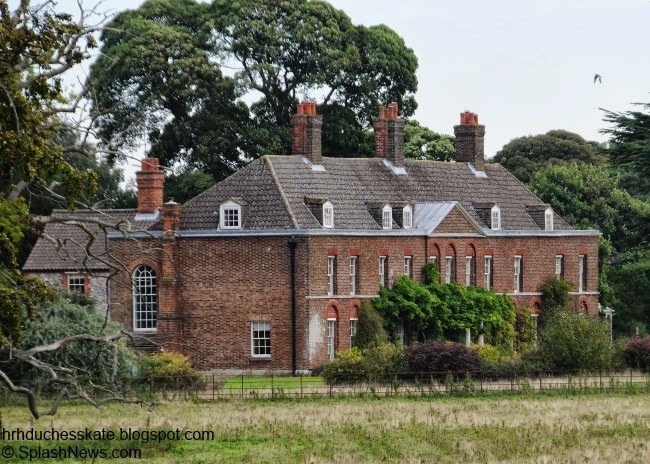 However, I think Anmer hall will probably be more of the favorite home for the Duke and Duchess will love since it will give them privacy and peace from the public spotlight. Good morning Charlotte, such a delight to see such wonderful pictures of KP and how the design process is coming along. The country home sounds warm and charming something you would see in the movies. I am happy for William and Kate to finally have a place to call home where new memories can be made with George. I want to thank my Duchess Kate Friends for getting me through the loss of my Mom they have been my ROCK!